Many outer ear infections in cats require medicine to be put directly into the ear. Some cats may also need ear cleanings at home. Your veterinarian can tell you whether and how often to clean your cat’s ears. Severe infections or ones that involve the middle or inner ear may require oral medication in addition to an ear medication. The ear is a very delicate structure. It is very important to closely follow your veterinarian’s recommendations for medicating your cat’s ear. Treating too frequently or too aggressively can make the problem worse, not better. Sensitive, already inflamed parts of the ear can be damaged. It is important to use only medicines prescribed by a veterinarian. Choose a space that’s easy to clean (e.g., bathroom, laundry room, shower stall). Applying the medicine can be messy. Fold the earflap down against your cat’s head and try to prevent your cat from shaking his or her head too much. Gently massage the very base of the ear to distribute the solution as far as possible into the ear canal. Ask your veterinarian to demonstrate this massage. Please contact your veterinarian if you are experiencing difficulties in administering any medication. Place your cat on a stable work surface that you can stand next to, and allow him or her to lie down, either in an upright “sphinx” position or flat on his or her side. While standing next to your cat, put the arm you will use to treat the ear over your cat’s shoulders, and use your upper arm and elbow to press your cat against your torso to help keep him or her still. You can use your other hand to hold your cat’s head still and keep the earflap back. If necessary, move to your cat’s other side or turn your cat around to treat the other ear. If you don’t have a high work surface, you can use the same method while seated on the floor, either holding the front of your cat’s body partially against your body or with your cat in your lap. If your cat struggles, talk to him or her calmly. Stop if he or she becomes extremely agitated. 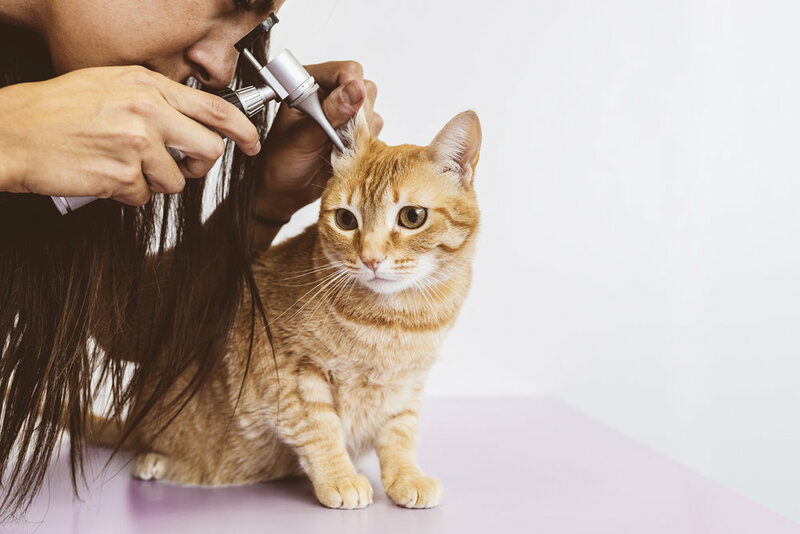 Massaging the base of the ears (unless they are painful) should feel good to your cat and may help calm him or her enough that you can resume treatment.